Scholastic chess in Detroit is growing quickly. | Photo: Scott Talley. A recent study from the Asian Journal of Psychiatry suggests that chess therapy may help individuals with panic disorders. While more research is needed to verify the results, the self-reported study shows that individuals who played chess on a smartphone app against comfortable levels of strength were able to regulate levels of anxiety more effectively. Improvements to the study, like playing over the board are being considered to understand the scope of chess therapy. Chess therapy may be a critical development for mental health. Boston's NPR Station interviewed WCM Phiona Mutesi, the focus of Queen of Katwe, to discuss her childhood in Kampala, Uganda and her life after the film's release. In the interview, Mutesi shares how chess provided her with the opportunity to receive an education in the United States. Mutesi is now an undergraduate student at Northwest University in Seattle, Washington. WCM Phiona Mutesi enrolled in Northwest University in 2017. | Photo: David Llada. The chess community is growing in the United States too! 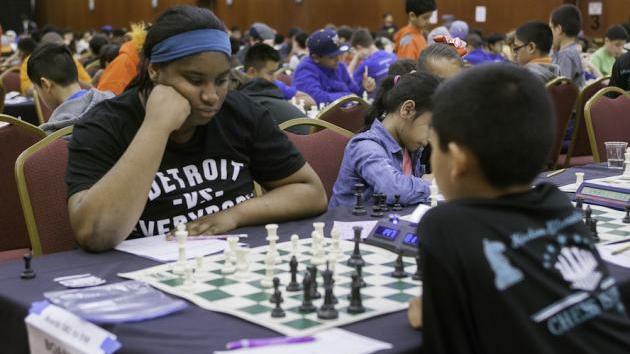 The Detroit School District is investing heavily in scholastic chess-almost $160,000 for chess sets, clocks, US Chess memberships, and school trips to the national chess championships. Two years later, scholastic chess in Detroit is growing quickly, as the city's number of public school chess club nearly doubled, and more schools are represented in local tournaments. Detroit is becoming a stronger force in national events in the United States. | Photo: Scott Talley. FIDE recently released a survey showing how much top chess players earned from tournament prize funds in 2018. The survey showed that over 4.8 million euros was awarded during the calendar year, with world championship combatants Magnus Carlsen and Fabiano Caruana combining for over 30 percent of the aggregated prize fund. FIDE also found that the Rapid and Blitz Championships, Norway Chess, the Grand Chess Tour, and Gibraltar offered the biggest prize funds for non-world championship cycle tournaments (world championships, Candidates, FIDE Grand Prix). Fabiano Caruana at last year's Isle of Man Tournament. | Photo: Maria Emelianova/Chess.com. Ennio Morricone is one of the most famous Italian composers of our time, as well as an orchestrator, conductor and former trumpet player. He is especially known for composing over 400 scores for cinema and television, including famous films such as A Fistful of Dollars, For a Few Dollars More, The Good, the Bad and the Ugly and Once Upon a Time in the West but also The Untouchables, In the Line of Fire and The Hateful Eight, to name just a few. In a recent interview for The Paris Review, Morricone discusses his passion for chess, and its similarities with music. "In chess, the two dimensions remain spatial, and time is what players have at their disposal in order to make the right move. In addition there are horizontal and vertical combinations, different graphic patterns, just like musical notes in harmony." Ennio Morricone is a chess lover. | Photo: Georges Biard/CC BY-SA 3.0 License. Peter Doggers contributed to this article.